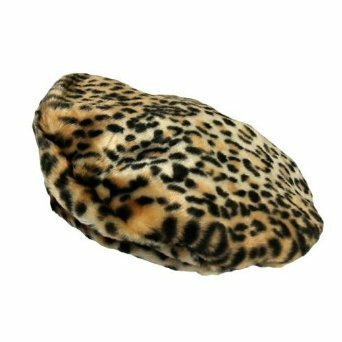 Luxurious look in Leopard pattern and feel of real fur, but it is faux. Beautiful shades of tan and golden browns make up the animal print of this hat. The fabric is thick and warm. The interior is fully lined in polyester. Hat has a 22 inch circumference. No brim on hat. Hat crown is 3 inches high.